I love a good classic salsa, but nothing beats a little variety in your salsa arsenal. I actually like a salsa that is fruit based to provide a different flavor profile. But, why go to the store when you can make it at home? As with everything it is all about the proper balance. I love pineapple, so it is no surprise that this is my choice for my fruit component. Pineapple turns out to be a perfect choice when you want a little complexity. Pineapple is naturally sweet but can have some acidity so it is already balanced. Once you put it on the grill the pineapple gets some char and some subtle and useful bitter notes. Therefore, it is an excellent choice for a fruit based salsa. There are other fruits that will offer a similar profile and if you prefer those, then use them. I think pineapple fits the bill the best in this application. Besides our three main ingredients you are only in additional need of a pinch of salt, pepper, and maybe a splash of olive oil to round the salsa out. Oh, did I mention that this is about the easiest recipe you will find? When I originally debuted this salsa I had l had lumped it together with my regular salsa. That was great, but I realized that this salsa needed to be its own headliner. So, without further adieu, here you go! Slice pineapple into rounds, quarter a red onion, and throw a whole jalapeno on the grill until they become caramelized, charred and have softened up a little bit. I would say this will take about 15 minutes total. Keep an eye on the pineapple so it doesn’t get burnt and bitter. After you have achieved charry goodness, chop the pineapple and red onion up to your desired size, and toss into a bowl. Treat the jalapeno like we do roasted red peppers. Throw it in a bowl, cover with plastic wrap, and steam until you can peel the skin off the pepper. 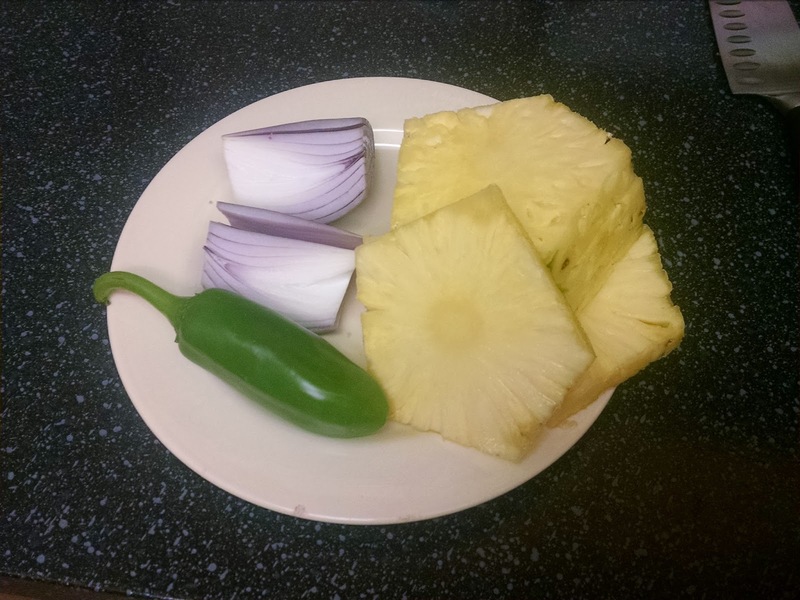 If you don’t mind the heat, leave the seeds and ribs, cut the pepper into a small dice, and mix with the pineapple and onions. Otherwise, you can scoop out the seeds and ribs to remove any lingering heat that may be left in the pepper. Season with salt and pepper, add a few teaspoons of olive oil, stir, and you are done! Serve with chips, fish or as a salad or burger topper. Again, you could use it for so much more! 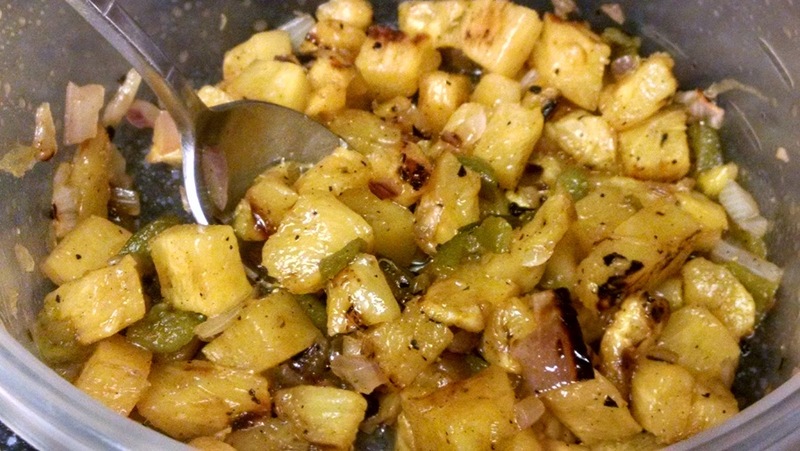 The pineapple is sweet, a little charred, but pairs perfect with the red onion that still has a little bite, and the jalapeno provides a very subtle, gentle heat. Here is the finished product!! Give this a try! You won’t be disappointed!